Commonwealth has been the US distributor of Stokkebye's Bali and McClintock brands since 2005. In Jul '07 they bought the brand rights, i.e. Bali and McClintock are no longer Stokkebye brand names. While most of the products are still made by Stokkebye, Capt. Mike reports that Commonwealth is discontinuing the 13oz cans of Stokkebye/Danish made McClintock and is introducing 16oz bags of Polish made McClintock. ($15.75LB @ Lil' Brown)... It looks like the whole McClintock line-up is being replaced with Polish made, bagged tobacco. Reviews are on the McClintock page. Well we won't have that problem for long; since McClintock will no longer be available in cans. They are shifting to 1Lb bags to keep up with the other bulk products out there, and I understand the product is now being made in Poland, and that quality has taken a hit, but we'll see! ...duh. They became the US distributor in '05 and purchased the brand rights in Jul '07. might not the bags be good for poor lazy SOB's like me??? you know your friend started the bags??? Who say's you're poor, lazy SOB? My friend, I'm not in the habit or mindset to be taking other people's inventory; since there use to be so many willing and ready to take mine, I thought they were lined up 6 deep in rows of 3! back in the can. Have you ever wondered why all the can manufacturers only offered regular sized papers? It's because the average weight of a regular is about 3/4 Gram; where as King size roll--ups weigh about a Gram. I'm getting more detailed than I wanted to here, so l'll say it straight out! Mark told me back in 1992 when he first started, he used the 1 lb bags, because it was a standard American measure of weight. His shipping boxes were designed to hold one bag of tobacco, and 2 boxes of tubes. After a time folks complained of having left over tobacco, and having to order a spare box of tubes; which he then had to send out in a box filled 3/4 full of packing material. A decision was made to go to the 14 oz bag to be consistent with the 200 tube boxes, and everyone lived happily ever after! I can only guess it's a new clone of the other matics, that would stuff McClintock, of course lol!!!! Mark told me that story as well. It never occurred to me that the 250 count tube packaging was designed for 1LB bags. The whole concept of packaging to achieve an equal tube to tobacco ratio implies 100% brand loyalty (tubes and tobacco, e.g. refill kits), its the only way it can come close to being a viable concept. To fully experience and enjoy making our own cigarettes we have to deal with all sorts of packaging, keeping an extra box or two of tubes around is no big deal. Well, I found this out the hard way. Bought some in the bag at JR, didn't know it was different. Been using it for several years. Noticed right away it didn't smell right but thought it was just me. Finally looked at the bag and saw the Poland line. This stuff is really lousy. Sent a message to Commonwealth, not too nice. I have to say they really screwed up a good blend. Anyone tell me if there is a Stokkebye that is similar or is very good in their opinion. I have tried most all of D&R, wasted a lot of money. McClintock was the best I ever found for me. Everything else I have tried is harsh to me. I have sensitive sinuses I guess, but McC never stopped me up or made me cough. My opinion, don't waste your money on the Polish McClintock. YUCK. BTW-FYI Mr. Stokkebye himself developed the McClintock blends. jim, what McClintock do you smoke? I am like you and have trouble with most cigarettes. Of all the brands D & R carries, I can only smoke Windsail. It has to be the plain Windsail, not the Windsail Silver or Light. It has American Gold on the front of the 14 oz package, but is listed on the order as Windsail. It is made of Virginia Gold leaf tobacco. I don't know what the difference is, but the other Windsails and other tobaccos they carry make me cough and some of the tobaccos give me a headache. It is the same at other tobacco companies. I don't know whether I am allergic to something in the others or what. I have tried a lot of mild virginia tobaccos that others have recommended, but Windsail is the best I have found for me. There is one other brand, I can smoke, but I will have to look up the info about it, so I will post about it later. Thought I'd bring the story of McClintock current. I too was a longtime user of McClintock. However, when they went Polish, their tobacco turned to absolute crap, and since they now only produce "expanded" tobacco in NY ('lower cost' for smokers taxed up to their eyeballs), it's even worse. Always stale, overly chopped up, at least 1/4 shake and inecusably large sticks. It hardly even qualifies as tobacco any longer. And it jams the machine beyond hope. 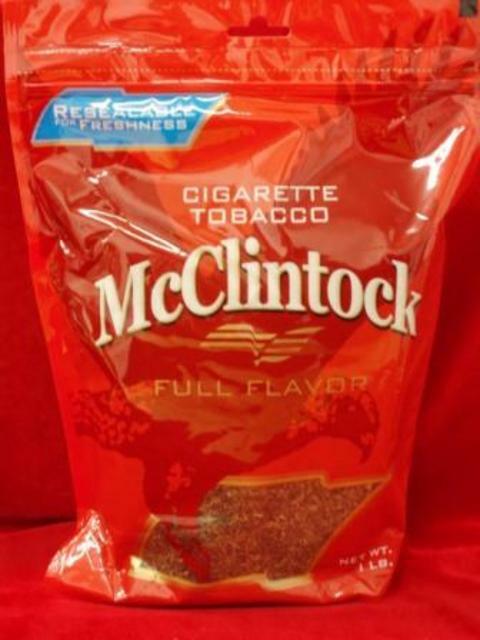 Wish I could find a tobacco that tastes like McClintock tasted when it wasn't junk.